The history of architecture in the IT world stems from the need to have scalable systems with re-usable components that simplify the process of building, deploying and maintaining enterprise systems, whilst taking care of all the major facets around data, security, interfaces and performance. Over the years, the role of architecture has grown, with more focus placed on bridging the gap between business strategy and IT strategy. In my working career, the best IT architects I've come across have been from the west coast of the US. This explains why a lot of design work happens in this area and development work completed in India, China or Philippines. Suffice it is to say, SOA may also be viewed as a paradigm of Application Architecture with a mandate for providing principles that influence design decisions that provide robust and well-built IT systems. In layman terms, Application Architecture is to a system development team what a building blueprint is to a team of construction workers. While there's no limit to the level of detail required, some teams keep it simple, providing only high level abstract physical and logical technical representations. Others may choose to delve deeper into granular details, including data models, security standards and data flow diagrams, just to name a few. Enterprise Architecture has a more overarching role and tends to have a holistic view of an organization in its current and future states from a strategy, business and technology perspective. 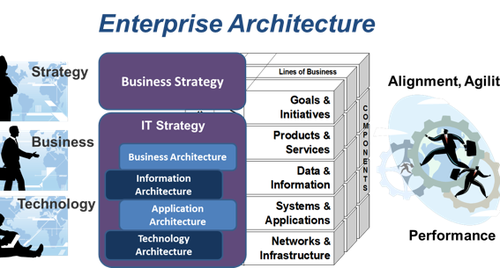 According to cio.com, Enterprise Architecture focuses on four crucial Cs: connection; collaboration; communication; and customers, with a primary concern on aligning a business's strategic vision with its information technology. The enterprise architect must therefore map, define and standardize technology, data and business processes that will satisfy today's and tomorrow's business needs. With such a view, the Enterprise Architecture role is critical in mapping IT resources that will integrate the business needs and what technology has to offer. It's critical to note that successful and effective CIOs often have world class Enterprise Architects as their right hand generals. Continuing with our earlier analogy, Enterprise Architecture is to an organization what a city master plan is to a city: It therefore follows that the initial inputs of Application Architecture will come from the Enterprise Architecture, without which the Application might not be compatible with, or fit within, the organization's strategy. Whilst most universities have placed an emphasis on churning out technical focused IT personnel such as system developers, web designers and graphic designers, very few unis (especially in Africa) have taken note of the role of Enterprise Architecture as a critical and defining field in the IT world. This explains why typical IT environments in most public and even private sectors comprise of a cobweb of multiple systems, devices, cables, servers and interfaces that cost millions to maintain annually, with no clear upgrade or replacement road maps. The value that organizations can yield from encapsulating Enterprise Architecture in their business processes is massive; the top one being provision of an organization's holistic view of how technology is designed, built, deployed and maintained. Lastly it's imperative to emphasize that Enterprise Architecture goes hand-in-hand with IT governance and collaboratively helps in establishing governance across the enterprise, which helps in building a controlled and well directed institution. It acts like a framework for leadership, organizational structure, business processes, standards, practices and so on. For IT folk with a passion in Enterprise Architecture, TOGAF framework is the de facto global standard for Enterprise Architecture and is governed by the Open Group Architecture Forum. TOGAF comes with a certification program: Qualification is achieved by passing two exams, following a course of self-study or attendance at an Accredited Training Course. There is also an entry level qualification, TOGAF 9 Foundation, which is achieved by passing just the first exam. 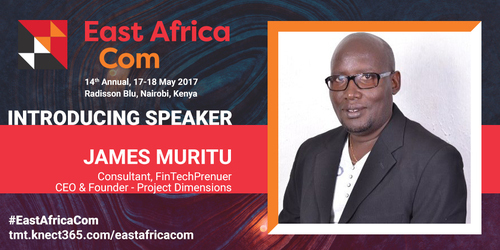 James Muritu will be speaking at the 14th annual East Africa Com, taking place between the 17–18 May 2017. James will be taking part in the panel discussion 'Digital transformation – the CIO, CTO challenge to lead the business' on day 2 of the event. To find out more about East Africa Com 2017 click here. East African operators and regulators attend East Africa Com for free, see if you’re eligible and sign up for your pass here. For all non-East African operators and regulators, purchase your full 2-day pass here. — James Muritu, Consultant, FinTechPreneur & Founder and CEO, Project Dimensions Ltd.